This article is about the film. For the Kikki Danielsson album, see In Country (album). Recent high school graduate Samantha Hughes, 17, lives in fictional Hopewell, Kentucky. Her uncle Emmett Smith, a laid-back Vietnam veteran, suffers from post-traumatic stress disorder. Samantha's father, Dwayne, was killed in Vietnam at 21 after marrying and impregnating Samantha's mother, Irene. Samantha finds some old photographs, medals, and letters of her father, and becomes obsessed with finding out more about him. Irene, who has moved to Lexington, Kentucky with her second husband, wants Samantha to move in with them and go to college. But Samantha would rather stay with Emmett and try to find out more about her father. Her mother is no help, as she tells Samantha, "Honey, I married him a month before he left for the war. He was 19. I hardly even remember him." Finally, Samantha, Emmett and her grandmother visit the Vietnam Veterans Memorial in Washington, D.C. Finding her father's name in the memorial releases cathartic emotions in Samantha and her family. To prepare for her role, Emily Lloyd stayed with a lawyer and his family in Paducah, Kentucky. In order to get into the mindset of a girl whose father has died, the young actress thought of the death of her paternal grandfather, Charles Lloyd Pack, a British actor to whom she was very close. Lloyd underwent training to speak with a Kentucky accent in the film. The veterans in the dance sequence are all actual Vietnam vets as well and their real family members accompany them. Of the five major characters who are Vietnam veterans, only one, Earl, is played by an actual Vietnam veteran, Jim Beaver. Ken Jenkins, who plays Jim Holly (the organizer of the veteran's dance), is the father of Daniel Jenkins, who plays Samantha's father Dwayne in the Vietnam flashbacks. Their casting in the film was purely coincidental. The commencement speaker was played by Don Young, the minister of a large Baptist church in Paducah, Kentucky. In an interview with The Paducah Sun, he said the speech had been written for him but joked that it was so good, he might "borrow" parts of it in future sermons. Much of the film was shot in Kentucky's far-western Jackson Purchase, where the original author, Bobbie Ann Mason, grew up. Her home of Graves County, specifically its county seat of Mayfield, was the location for many scenes. The walk-in doctor's office seen in the film is actually a dry cleaners which was renamed "Clothes Doctor" following its appearance in the film. Several other scenes were shot in the Purchase's largest city of Paducah, particularly the scenes inside Emmett's home. 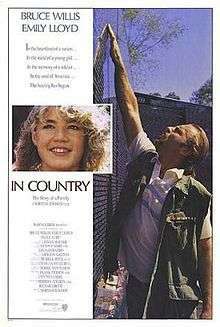 In Country had its world premiere on September 7, 1989 at the Toronto International Film Festival, which Bruce Willis attended and dedicated to Canadian war veterans who fought in Vietnam. The film was given a limited release on September 15, 1989 in four theaters grossing $36,505 on its opening weekend. It was given a wide release on September 29, 1989 in 606 theaters grossing $1.3 million on its opening weekend. It went on to make $3.5 million in North America. In Country was generally well received by critics. It has a 70% rating on Rotten Tomatoes based on 27 reviews. Film critic Roger Ebert gave the film three out of four stars and wrote, "The movie is like a time bomb. You sit there, interested, absorbed, sometimes amused, sometimes moved, but wondering in the back of your mind what all of this is going to add up to. Then you find out". In his review for the Globe and Mail, Rick Groen praised Emily Lloyd's performance: "Emily Lloyd, the callow Brit who burned up the screen in Wish You Were Here, is letter perfect – her accent impeccable and her energy immense". USA Today gave the film three out of four stars and praised Bruce Willis' "subsidiary performance as Lloyd's reclusive guardian-uncle is admirably short on showboating". In his review for The Guardian, Derek Malcolm praised Lloyd for her "portrait is of a lively waif who does not intend to be easily defeated by the comedy of life without adding a few jokes of her own, and it is the most complete thing she has so far done on the screen, good as she was in Wish You Were Here". Time magazine felt that the script "perhaps pursues too many banal and inconsequential matters as it portrays teen life in a small town", but that "the film starts to gather force and direction when a dance, organized to honor the local Viet vets, works out awkwardly". Furthermore, its critic felt that the film was "a lovely, necessary little stitch in our torn time". In her review for The New York Times, Caryn James criticized the "cheap and easy touches ... that reduce it to the shallowness of a television movie", and found James Horner's score, "offensive and distracting". Newsweek magazine's David Ansen wrote, "While one can respect its lofty intentions, the movie doesn't seem to have any better sense than its high-school heroine of just what it's looking for. At once underdramatized and faintly stagy, it keeps promising revelations that never quite materialize". In her review for the Washington Post, Rita Kempley wrote, "What's meant to be a cohesive family portrait, a suffering American microcosm, is a shambles of threads dangling and characters adrift. Jewison leaves it to stymied viewers to figure out the gist of it". ↑ Nightingale, Benedict (August 20, 1989). "The Americanization of Emily". The New York Times. Retrieved 2010-02-09. ↑ Van Gelder, Lawrence (August 18, 1989). "At the Movies". The New York Times. Retrieved 2010-02-09. ↑ Kelly, Deirdre (September 8, 1989). "In Country premiere dedicated to vets". Globe and Mail. ↑ "In Country". Box Office Mojo. Retrieved 2009-04-01. ↑ Ebert, Roger (September 29, 1989). "In Country". Chicago Sun-Times. Retrieved 2009-04-01. ↑ Groen, Rick (September 15, 1989). "Festival of Festivals: In Country". Globe and Mail. ↑ Clark, Mike (September 15, 1989). "In Country: A small-town memorial to the war". USA Today. ↑ Malcolm, Derek (January 11, 1990). "America goes to the Wall – Hollywood is still coming home from Vietnam". The Guardian. ↑ James, Caryn (September 15, 1989). "In Country, Coping With Vietnam". The New York Times. Retrieved 2009-04-01. ↑ Ansen, David (October 2, 1989). "Up Against the Wall, Again". Newsweek. ↑ Kempley, Rita (September 15, 1989). "The War In Country". Washington Post. Retrieved 2009-04-01.